The beginning of industrial production on the present-day premises of the company dates back to 1872 when a sugar refinery was built near railway connecting the city Bílina with Ústí nad Labem. During the WWII the plant served as production and storage facility of ammunition which were located here until 1957. During the socialist era Enaspol, at that time running under the designation Plant Velvěty, was part of a chemical syndicate Spolchemie Ústí nad Labem. Chemical production began shortly after the WWII with the launch of resins and laminated roofs production. In 1958 research of aerosol products was introduced at the site, followed by the very first serial production of sprays in Czechoslovakia in 1961. Between the years 1968 – 1969, a continuous sulfation line for the manufacture of surfactants was built on the site of former ammunition dump. The same period saw launching of textile auxiliaries production. These productions were extended by the production of polynaphthalene sulfonates in 1970 to cover the demand for concrete superplasticizers and dyestuff dispersants. In the following years the plant became a major producer of textile auxiliaries for the whole communist bloc. At its peak in the turn of 70s and 80s the production of textile auxiliaries was reaching as much as 30.000 tonnes/year, thus completely covering demand of textile producers in Czechoslovakia, East Germany, Poland, Hungary, Romania, Bulgaria, Soviet Union and Mongolia and other countries of the bloc. 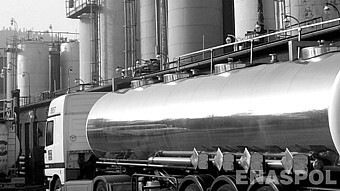 Modern history of the company begins in 1993 with the foundation of Enaspol, s. r. o. In June 1996 the company was transformed into a joint stock company under the name Enaspol, a. s. Privatization occurs in 2000 which is also the year of the current owner’s capital entry. 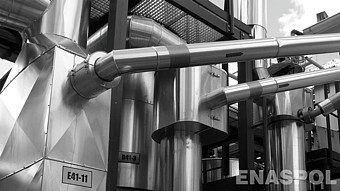 In 2007 the production capacity of polynaphthalene sulfonates was doubled and in 2011 Enaspol doubled its sulfation capacities. At present the company’s payroll includes more than 85 dedicated employees and its product portfolio undergoes the process of specialization into narrowly specific industries.